The British Indian Ocean Territory is centrally located in the Indian Ocean, south of the Maldives, about halfway between Madagascar and Indonesia. The main island, Diego Garcia, is a military facility off limits to anyone not on official duty, but some of the uninhabited outer islands can be visited by independent yachters with advance permission. To quote the British Indian Ocean Territory travel advice through the British Foreign Office: "The British Indian Ocean Territory is not a tourist destination. Access is restricted and a permit is required in advance of travel. There are no commercial flights and permits are only issued to yachts in safe passage. Access to Diego Garcia is only permitted to those with connections to the military facility." Established as a territory of the UK in 1965, a number of the British Indian Ocean Territory (BIOT) islands were transferred to the Seychelles when it attained independence in 1976, leaving only the six main island groups comprising the Chagos Archipelago of 2,300 islands. The largest and southernmost of the 58 islands, Diego Garcia, contains a joint UK-US naval support facility. All of the remaining islands are uninhabited. Approximately 3,000 former agricultural workers, earlier indigenous residents in the islands (often referred to as Chagossians or Ilois) were relocated primarily to Mauritius but also to the Seychelles, between 1967 and 1973. In 2000, a British High Court ruling invalidated the local immigration order which had excluded them from the archipelago, but upheld the special military status of Diego Garcia. Later in June 2017, the matter was sent to the International Court of Justice. No timetable has been set for the Ilois return, but when they do they plan to reestablish copra production and fishing. Flat and low (most areas do not exceed two metres in elevation). The BIOT Marine Protected Area protects a variety of wildlife, including 1% of the world's coral reefs. You may see endangered species such as green turtles, hawksbill sea turtles, sharks, and rays, and the territory also includes species that don't exist anywhere else in the world: the Chagos brain coral and Chagos anemone fish. Other wildlife includes tuna, billfish, and eighteen species of seabirds, including red-footed and brown boobies and sooty terns. Fish in the territory are able to thrive due to the prohibition on commercial fishing; the reefs here have more fish than anywhere else in the Indian Ocean. Unfortunately, the prohibition on diving means that your chances to experience the coral reefs and thriving fish populations will be limited. You can enjoy whatever you can see from the surface, though, as well as the seabirds and the flora on the islands. The islands are also abundant in coconut crabs, the world's largest land arthropods, which can grow up to a meter in length. Native trees include the Indian mulberry, sea trumpet, and tropical almond. Coconut trees left over from the islands' plantation years are also plentiful. Many of the territory's rules, including the limits on fishing and mooring, exist to help protect the wildlife. The territory is vulnerable to invasive species; rats introduced to some of the islands in the 1700s have already harmed native birds and plants. Don't threaten the wildlife by bringing any non-native species. Before coming to the territory, scrub your hull, wash fruits and vegetables, and inspect everything closely to ensure there are no stowaway insects or spiders. Don't bring live plants with you into the territory, and when you go ashore, check everywhere for hidden seeds, insects, spiders, or other small animals. Tropical marine; hot, humid, moderated by trade winds. December through February is the monsoon season; June through September is the drier winter season with slightly cooler temperatures. If you need to make a stop in the territory as part of a longer Indian Ocean sailing trip, there are some designated locations on the outer islands for you to moor. Valid yacht mooring permits for up to 28 days can be obtained from the British Indian Ocean Territory Administration, Foreign & Commonwealth Office, for a fee of £50 per week. Details here. The mooring permits allow you to moor only at designated anchorages; some of the other islands are strict nature reserves and may not be entered. Apply at least six weeks before you plan to arrive in the territory. In order to get a permit, your passport must have at least six months' validity from your date of entry into the territory, and you must prove that mooring there is necessary for your safe passage across the Indian Ocean and demonstrate proof of adequate travel insurance and yacht insurance. Your permit is only valid for the specified dates. If weather or other circumstances force you to change your dates of travel, you must contact the territory administration before the date on the permit and ask them to amend it. Don't moor in the territory outside the dates you have permission for. The designated anchorages are five specific areas, two on islands in the Salomon Islands atoll and three on islands in Peros Banhos atoll. Exact details will be provided by the BIOT administration with your permit. -5.33473272.2672142 Ile Fouquet and Ile Takamaka (Salomon). -5.25614771.7642563 Ile Diamante (Peros Banhos). -5.44689871.7600794 Ile du Coin (Peros Banhos). -5.46153371.809165 Ile Fouquet (Peros Banhos). The shaded portion of Peros Banhos atoll is a strict nature reserve and thus off limits for travellers, as are several other islands in the territory. Several of the other islands are strict nature reserves. You may not anchor, land, or approach within three nautical miles of these islands: Cow Island, Danger Island and the drying coral reef, Eagle Island, Nelson's Island, and the Three Brothers and Resurgent Island. In addition, the eastern portion of Peros Banhos atoll is equally off limits. All wildlife on and around these islands is protected. Anyone who violates these rules by approaching the islands may be fined £1,000 on the spot, with increasing penalties if you fail to pay. 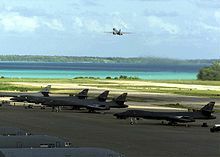 Diego Garcia is a military facility with a large American and British military presence. Entry is restricted to military personnel and other people affiliated with the British government, visiting on official duty. The island has both a military airport and a harbour, but unauthorised vessels are strictly prohibited from approaching within three nautical miles. -5.31131772.2648441 Île Mapou (Salomon Atoll). Has the most birds of any island in Salomon Atoll because it's rat-free. The clear blue water on the lagoon side of Diego Garcia (except after stormy weather). Catalina Beach (near The Plantation). The beach with a wrecked aircraft. The Plantation. A former coconut plantation on the eastern end of Diego Garcia, out of use since 1970. The buildings have been restored. Turtle Cove (south of the island). Watch the endangered turtles hanging out, as well as lemon sharks, blacktip reef sharks, and cowtail stingrays. Snorkel – the marine life is spectacular. Beware of sharks, though. Go for a hike through the coconut jungles, ruined buildings, and pristine beaches. Meet other travellers. The mooring sites sometimes get more than one boat at a time, especially the popular "yacht club" on Ile Boddam, where you may be able to socialize over some barbecued fish on the beach. You may be able to find a bit of sports equipment. Boddam Island has a swing and a volleyball court. Diving, spear-fishing, and removal of flora and fauna are prohibited. Plantation Trail – a walk to the beach, a little over ten minutes, that allows you to see various native trees, ferns and coconut crabs. Non-native trees have been cleared and native trees planted—most of the work, including the construction of the trail, has been done by volunteers. The trail includes a loop, so you can see a different area on the way back. Informative signs at the beginning of the trail tell you about the tree species you'll see. Snorkel Trail – follow a series of nine buoys over a shallow area of water where you can see a beautiful coral ecosystem. Masks and snorkels are available from the marina office. Commercial activity of any kind is strictly prohibited. Independent yachters must be self-sufficient, so bring whatever food you need. You are allowed to catch fish for your own consumption within three days. Use a rod or line only; spear fishing is strictly prohibited. Keep a log of your fishing in case the British government asks to see it. Don't bring any fresh food ashore with you, for fear of accidentally spreading non-native seeds or small animals. Most of the islands have old wells with fresh water, including Ile Boddam, Ile Takamaka, and Ile du Coin. The water isn't drinkable, but it is usable for washing and can be filtered and purified. On the outer islands, you're not allowed to remain on shore between sunset and sunrise, or set up any kind of camp or structure. So you'll be sleeping on your boat. The old buildings on Ile du Coin and Ile Boddam are structurally unsafe, and visitors enter at their own risk. The territory is tightly controlled, with fines and possible imprisonment for violations of its numerous rules. Do not go within three nautical miles of the strict nature reserves or Diego Garcia; kill, remove, or disturb any flora or fauna (except the limited fishing that is permitted), including shells; introduce any foreign flora or fauna (including pets, which must remain on your boat); stay ashore overnight; do anything that risks damaging the old buildings; leave behind garbage except in designated receptacles; import drugs; or go diving. The territory is very remote, and no medical facilities are available. Be prepared to get a medical evacuation if you need it. If you have an emergency, you can contact Diego Garcia for assistance on 2.182MHz HF SSB or 00 246 3702938. 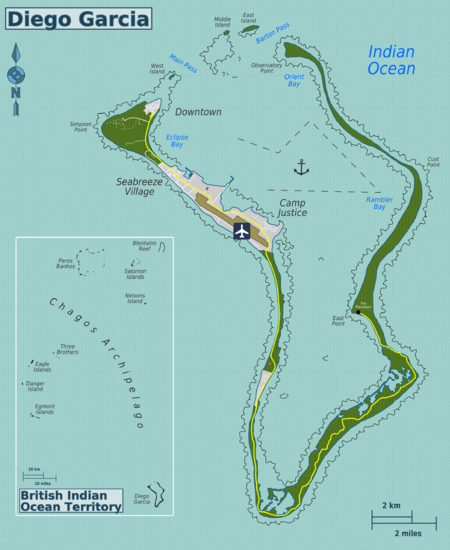 This park travel guide to British Indian Ocean Territory is a usable article. It has information about the park, for getting in, about a few attractions, and about accommodations in the park. An adventurous person could use this article, but please feel free to improve it by editing the page.